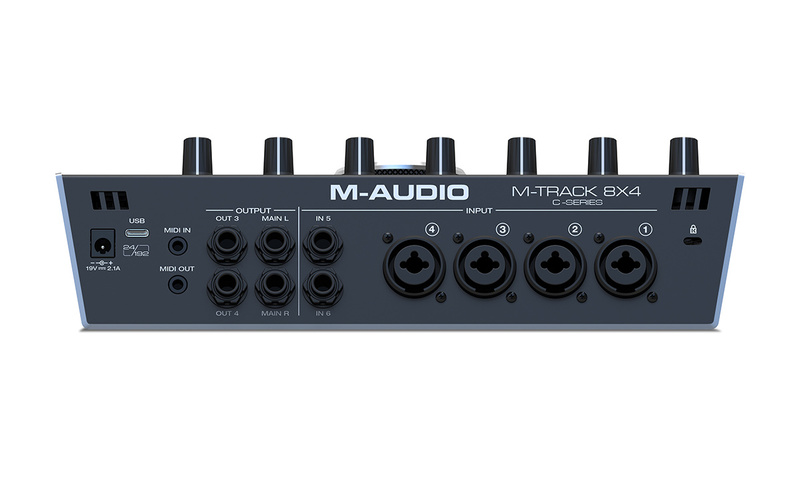 The M-Audio M-Track 8X4M is an 8-in 4-out feature-packed USB audio/MIDI interface that provides all of the connections you need to easily create professional 24-bit/192kHz studio-quality recordings. Boasting an elegant pro-grade metal chassis with a large central monitor volume knob, the M-Track 8X4M features transparent low-noise Crystal Preamps™ and pristine A/D converters that deliver the highest audio performance in its class. The M-Track 8X4M features (4) XLR+¼” TRS combo inputs, (2) ¼” line inputs and (2) ¼” instrument inputs that have a specially designed gain and impedance stage to provide the most accurate representation of your guitar or bass when plugged directly into the interface, along with a MIDI input and output. 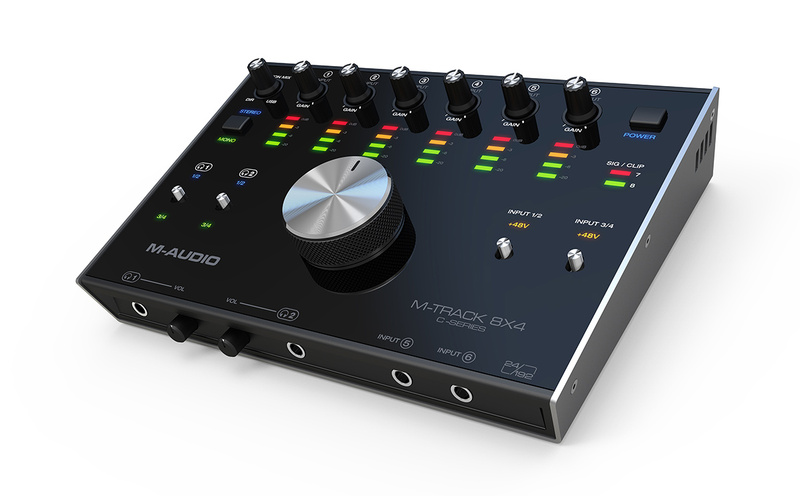 The M-Track 8X4M has a stereo pair of ¼” studio monitor outputs, and (2) ¼” assignable outputs. Two musicians can have their own separate mixes while recording by using the (2) ¼” headphone outputs with independent source and level controls. The M-Track 8X4M can connect to either the standard USB A port on your Mac or PC, or the USB C port. Cables for both are included: a USB C to C cable and a USB C to A cable. This premium Hi-Speed USB connection and USB/direct control enables you to have zero-latency monitoring, making the recording process easier than ever. The overall combination of professional audio performance, easy-to-use features, and the included software bundle makes the M-Track 8X4M an amazingly versatile, high-performance audio interface that will conquer any recording session with ease. The M-Track 8X4M comes complete with a software package that has everything to get you started making professional recordings right of the box. With 2 powerful DAWs to suit your production needs, M-Track 8X4M includes Pro Tools | First M-Audio Edition, and Ableton Live Lite. Pro Tools is the industry standard for recording software and we’ve teamed up with Avid to craft a version of this terrific collection specifically tailored to our hardware. This amazing audio and MIDI recording software helps inspire any artist, musician or singer-songwriter to create, record and share all their ideas across the world at any time. Ableton Live Lite is one of the most popular performance and production programs available in the world. A powerful music creation tool, Ableton Live Lite enables musicians and producers to spontaneously compose, record, remix, improvise and edit musical ideas in a fluid audio/MIDI environment. We’ve also added an entire Effects Plugin, and Virtual Instruments package to cater to all your production needs. Whether you need a guitar tone, reverb, or delay we’ve got your effects needs covered with Eleven Lite, 20 effect plugins and AIR’s Creative FX Collection. With the included AIR Virtual Instrument plugins, you’ll have virtual drummer, synth, strings, percussion and piano plugins to add world-class-sounding instruments to your songs with ease. The M-Track 8X4M features 8 inputs for simultaneously recording up to 8 channels at once to meet all your studio’s recording needs. The (4) dedicated XLR/TRS Mic/Line combo inputs with Crystal Preamps™ and phantom power are perfect for recording a vocalist, or vocalists, mic’ing up an acoustic guitar, vintage guitar or bass amp or the core elements of a drum kit. The (2) ¼” dedicated Instrument inputs use specially designed gain and impedance staging to provide the cleanest signal from your guitar, bass or keyboard, while the (2) ¼” dedicated Line inputs provide a pure uncolored signal for connecting a tube preamp, keyboard, synth or mixer, and MIDI input and output for connecting any of your boutique synth gear. At the center of the M-Track 8X4M is a large metal monitor volume knob with inlayed rubberized diamond textured comfort grip for dialing in your studio monitor’s volume, and smoothly referencing your mix at both high and low levels. The monitor and headphone outputs feature a direct mono/stereo switch and direct/USB mix knob. The (2) ¼” headphone outputs have independent volume controls, and source select switches let you create mixes to suit your and your artist’s needs. In addition to the (2) ¼” rear panel monitor outputs, the M-Track 8X4M sports an additional (2) ¼” outputs for connecting outboard gear. Our engineers designed the Crystal Preamps™ to provide engineers, producers and musicians with a transparent, low-noise preamp that guarantees the best sound from your microphones and captures your performance exactly the way you intended. The M-Track 8X4M incorporates pristine A/D converters to provide 24-bit resolution digital audio for explosive dynamic range that captures every nuance and subtlety of your performance. When combined with the class-leading sample rates of up to 192kHz, you can be sure your recordings are completely clear and true to the performance. With layout and component choices that were carefully crafted by our engineering team in America, we’ve made sure you’re getting the best sound available. When capturing a performance, you want to get the best levels possible. With the M-Track 8X4M’s segmented input VU LEDs (-20db through 0dB), you can dial in the perfect gain setting every time, so there’s no more guessing how close or far away you are from optimizing your signal.